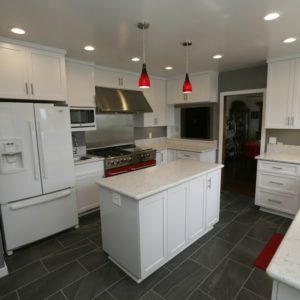 When undertaking a major project such as Kitchen remodeling in Rowland Heights CA, it’s really important to have the right contractor on the job. At Cabinet Magic, we believe we are that right contractor. As a licensed contractor, we can take you through every phase of the project with ease, from the initial design planning to sourcing the best designer materials–including custom cabinetry–to installing and finishing everything to a high standard. Kitchen remodeling in Rowland Heights CA sometimes requires a leap of faith as you go from your sample selections to the real thing. For example, you may worry that your flooring and countertop won’t complement one another like you’d hoped, or that the color you’ve chosen for your cabinets will be too dark once a whole wall of cabinetry is installed. With Cabinet Magic as your contractor, you’ll never get left in suspense regarding how your kitchen remodeling in Rowland Heights CA will turn out. We know you want to feel confident of what you’re getting before you entrust us with the project. That’s why we always bring proposed kitchen designs to life using 3D rendering software. We’re happy to create multiple versions of the design so you can easily compare different options. We never begin work without your sign off and approval of every detail of the design. Custom cabinets give you the ability to control not only the appearance your cabinets, but also their functionality. After nearly 30 years in the business, our skilled craftsmen have truly mastered the art of custom cabinetry. We can match any architectural style and also include all kinds of functional accessories from lazy susans to pull-out trash bins to appliance drawers and more. We are true perfectionists and we take great pride in delivering quality cabinetry that lasts. If you are interested in working with Cabinet Magic for your kitchen remodeling in Rowland Heights CA, please give us a call at 800-828-4380 so we can set up a free in home consultation with one of our knowledgeable team members. We can help you price the upgrades you want and give you a free estimate.